POWERFUL ACTIVE NOISE CANCELLING TECHNOLOGY: Built-in high-precision ANC inverter noise reduction circuit can reduce 95% low frequency background noise(20HZ-1KHZ), up to 26dB. By switching the noise cancelling mode, you will enter into a quiet world to enjoy the pure sound when in travel, at work or anywhere. It will reduce the noise of city traffic, drone of a plane cabin or hubbub in a busy office. SUPERIOR SOUND: 40mm diameter large-aperture speaker drivers with high-end corona diaphragm provides high clarity of sound with the deepest enhanced bass available. 20 meters transmit distance without any obstruction. It is equipped with CSR8635 Bluetooth V4.0 chips, accurate and low latent wireless transmission which guarantees the clear and fluent sound. RETRACTABLE & COMFORTABLE OVER-EAR DESIGN: Retractable headband and protein ear pads deliver more durability and comfort for long-term wearing. 90° swiveling earcups makes it convenient to carry in handbags or backpacks. The ear pads can completely cover both of your ears, no pinching and squeezing! EXTENDED BATTERY & COMPATIBILITY: Built-in 350mAh rechargeable lithium-ion battery supporting up to 12 hours playing time with 2-3 hours charging time. Stand-by time can reach 400 hours. 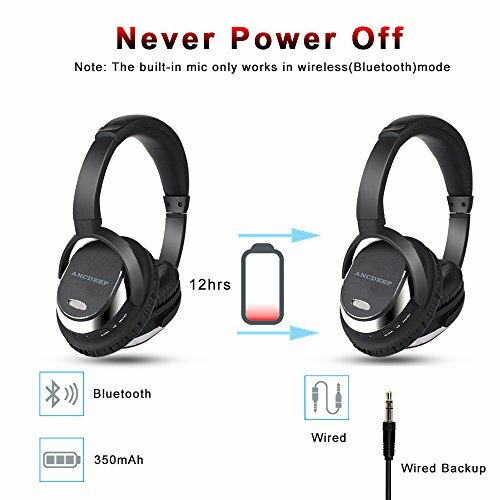 Compatible with iPhone, Samsung, Huawei, LG, IOS, Android phones, iPads, Tablets, Portable Music Players, MacBook, Laptop PC, wired connection is also available by inserting the 3.5mm audio cable(included). SATISFACTORY WARRANTY & CUSTOMER SERVICE: 30-day money back guarantee, 18-month manufacturer’s warranty, lifetime support and 24-hour customer service. We stand by our products and committed to improvement.